Vampires invade the Grimm Universe - and these ones don't sparkle. When Samira, the Queen of all Vampires, returns to Earth after over a century of banishment, she rallies her troops in a mission to kill every monster and High Born who won't bow before her. Can Helsing, daughter of the famed vampire hunter himself, send Samira back to the grave before the world is enslaved?
" 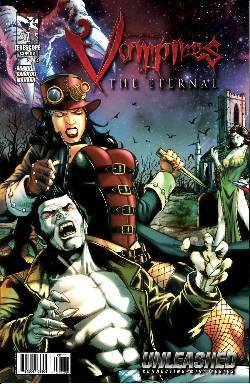 * Van Helsing back-up stories in each issue!